It’s not uncommon in today’s world to segment aspects of our lives. Compartmentalization is the buzz word of the day, but I have an even better buzz word to chew on…..CONGRUENCY. In many countries on four continents, Launching Leaders has worked with groups of 20 and 30 somethings, and one of the things we’ve noticed is some are adamant that our spiritual and professional lives should never intersect. They could perhaps be parallel aspects of a person’s life, they say, but the spiritual and professional are still fundamentally different and distinct. The thought is that since the different facets of our lives carry different expectations, responsibilities, and social interactions, we need to mold and change our behavior according to what we’re doing, where we are, and who we’re with. In some ways, this approach makes sense. For example, when you go to your place of worship, worshipping openly and publicly is not only appropriate, but also helpful and productive. At work, though, it’s probably more appropriate to say a silent prayer to yourself, or to find a private place. These kinds of adjustments will help you be a socially aware and more sensitive person. But more fundamental than making slight adjustments to behavior, is the belief by many that the best way to approach life is to see it as a collection of separate threads that are so inherently different from one another that they should never intersect. In contrast to this approach is the idea of developing a congruent life, which is both fulfilling and refreshing; a release if you will into a more authentic and holistic life. When we try to break our lives down into distinct segments, and then try to become a different person for each one, what we’re really doing is introducing all sorts of gaps into who we are and how we’re trying to live. Attempting to straddle these gaps by living with a foot on each side of the divide causes conflict and incongruence. It also fails to recognize that the same principles of respect, honor, kindness, professionalism, and courtesy do in fact apply across the board, whether it’s our attempts to be a good businessperson, a good friend, or a good person in general. The conclusion, as determined by Millennials who have taken the Launching Leaders course, is rather than trying to break their lives apart into multiple segments, they should try to live a more unified, consistent, and Godly life. This powerful commitment applies to all generations and will put us on the path toward true happiness and success. Regardless of our social or economic status, congruency will bring us peace. The tiller is a long-curved handle attached to the rudder. It is primarily responsible for controlling the direction of the boat. When you push the tiller to one side or the other, the rudder steers the boat in that direction. While sailing, the boat’s movement is very sensitive to the activity of the tiller; you can literally feel this sensitivity in your hands. To maintain control of the sailboat, you must keep your hand on the tiller at all times. If I ever had to leave my post to unfurl a sail or to take care of something else not within my immediate reach, I’d use a rope to tie the tiller in place. 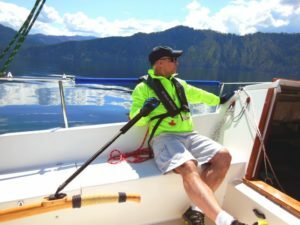 This would allow the boat to keep moving in the right direction for the minute or so that it would be unattended, but as soon as I’d completed whatever task had pulled me away, I immediately return to my seat at the tiller. When the sails were properly adjusted and the tiller was steady in my hand, everything clicked into place and the harmony of it all was amazing. In those moments, I was moving swiftly in the direction of my charted course. If I were to suddenly let go of the tiller, everything would quickly fall apart. The boat would turn directly into the wind, the sails would flutter, and I would be dead in the water—or worse. Letting go of the tiller and the mainsheet for a brief moment was OK, but it wouldn’t take very long at all for my progress and direction to come to a sudden halt. In life, as in sailing, it’s essential to always keep your hand on the tiller to ensure that you’re moving in the right direction. When you fail to keep all aspects of your life in harmony with the values and principles that are most important to you, you’re taking your hand off the tiller that guides your life. When you fail to consistently live your values and principles, you’re leaving your fate to the winds. In contrast to this directionless floating, living a congruent life will enable you to keep your hand on the tiller so that you’re steadily progressing toward your most important life goals. It’s important to understand that when you take your hand off the tiller, you haven’t accidentally lost control; you’ve deliberately relinquished control. Keeping your hand on the tiller requires conscientious effort. It takes hard work to consistently be the same person at all times and in all places, especially when no one is watching. Letting go can seem so easy, but once you give up control of the tiller, you’ve left yourself at the mercy of the wind and the waves. Psychologists have said that trying to juggle different standards and lifestyles like this can create significant stress and harm. Trying to be one person in one setting and a very different person in another setting will eventually force a person to keep secrets, tell lies, and deceive others. This creates powerful feelings of shame and guilt. The longer a person tries to maintain a segmented life, the deeper they get pulled in, and they eventually end up developing two or more different selves who act in completely opposite ways. Some of these selves do things that are markedly different from that person’s “apparent” lifestyle. This juggling act is extremely difficult and stressful to maintain, and sooner or later, lying takes over that person’s entire life. But this kind of double life doesn’t only harm the person trying to live it; it also hurts all the people they lie to and deceive along the way. Duplicitous living creates an ever-widening path of harm that affects a huge number of people. This actually becomes an unethical practice and goes against the grain of being an ethical person which the rising generations hold dear. Clearly, the kind of segmented life the world thinks is OK is not sustainable in bringing our lives in alignment with both our personal ethics or God’s will. Truly, there can be no duplicitous living if we desire the type of divine guidance, blessings and peace we seek. Once you decide to live a life of congruency, a deep sense of trust, respect, peace, integrity, and abundance will follow. This topic has been a favorite discovery from Millennials who have taken the Launching Leaders course and read the Launching Leaders book in various parts of the world. The great American writer Mark Twain once said, “The best thing about telling the truth is you never have to think about what to say.” The same can be said of living a life that is free of divided standards. When you remain consistent in your standards and values across all aspects of life, no one will ever question where you stand. Living a congruent life does not mean perfection. Far from it. The key to peace however is to STRIVE to live within the core values we have established and to be the same authentic person in every phase of our lives. Congruency replaces chaos with peace, it replaces darkness with light, and it replaces discouragement with hope.